Windows Communication Foundation (WCF) is a .NET framework for developing, configuring and deploying services. 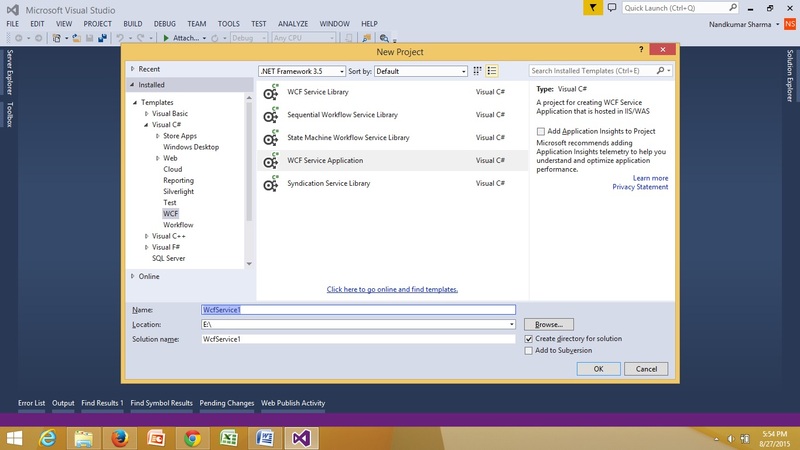 It is introduce with .NET Framework 3.0.It is service oriented technology used for exchanging information. WCF has combined feature of .NET Remoting, Web Services and few other communications related technology. Provide better reliability and security compared to ASMX web services. No need to make much change in code for implementing the security model and changing the binding. Small changes in the configuration will make your requirements. It can be hosted in IIS It can be hosted in IIS, windows activation service, Self-hosting, Windows service. Can be access through HTTP Can be access through HTTP, TCP, Named pipes. 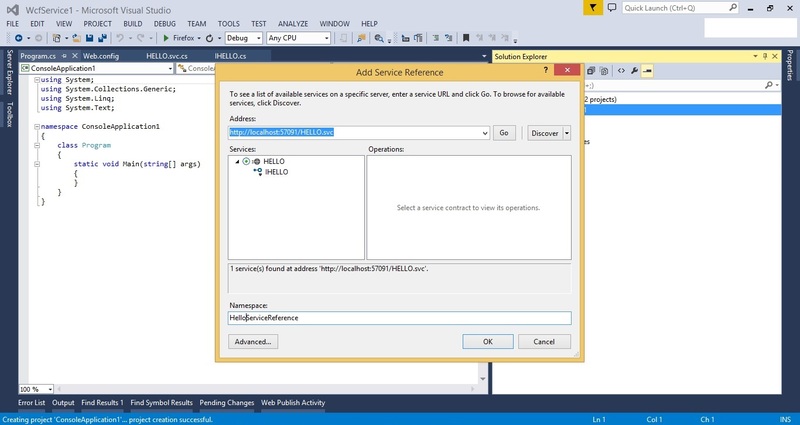 One-way, Request- Response are the different operations supported in web service. One-Way, Request-Response, Duplex are different type of operations supported in WCF. System.Xml.Serialization name space is used for serialization. System.Runtime.Serialization namespace is used for serialization. Can not be multi-threaded. Can not be multi-threaded. WCF Services has three important companent. Service Class – A WCF service class implements some service as a set of methods. Host Environment- It can be a application or a Service or a Windows Forms application or IIS as in case of the normal asmx web service in .NET. Endpoints –All the WCF communications are take place through end point. Endpoints consist of three component Address, Binding and contract. They collectively called as ABC’s of endpoints. Address: It is basically url address where WCF services is hosted. Binding: Binding will describes how client will communicate with service. Contract: The endpoints specify a Contract that defines which methods of the Service class will be accessible via the endpoint; each endpoint may expose a different set of methods. It is standard way of describing what the service does. Mainly there are four types of contracts available in WCF. Service Contract: describe the operation that service can provide. Data Contract: describes the custom data type which is exposed to the client. Message Contract: WCF uses SOAP message for communication. 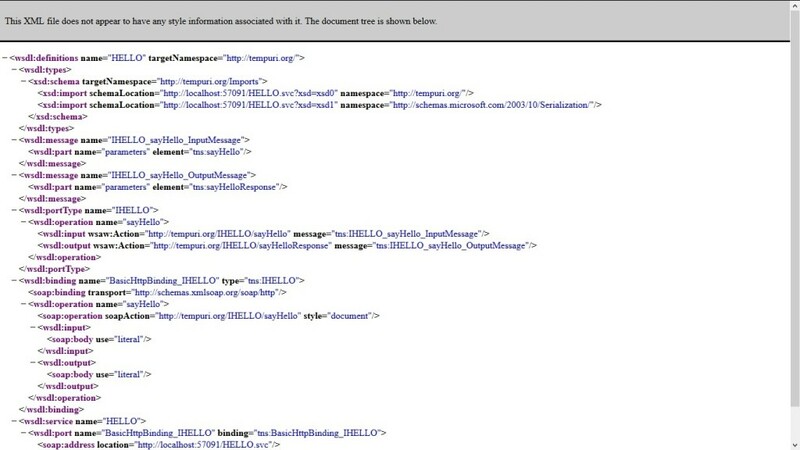 Message Contract is used to control the structure of a message body and serialization process. It is also used to send / access information in SOAP headers. By default WCF takes care of creating SOAP messages according to service DataContracts and OperationContracts. 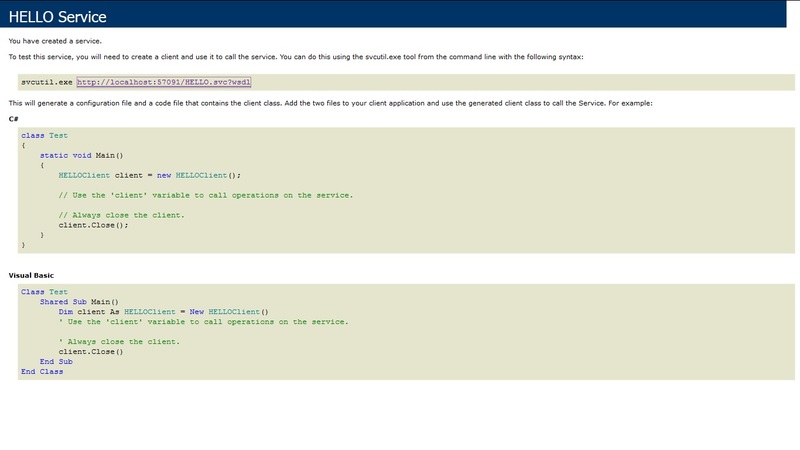 Fault Contract: Fault Contract provides documented view for error occurred in the service to client. This help as to easy identity the what error has occurred, and where. By default when we throw any exception from service, it will not reach the client side. 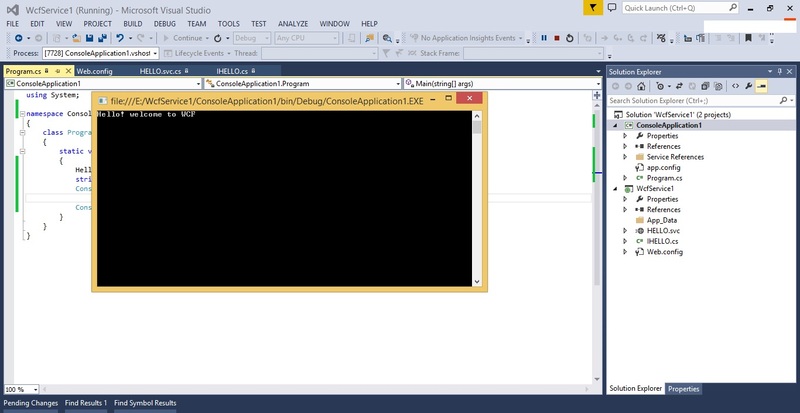 First open Visual Studio 2013. 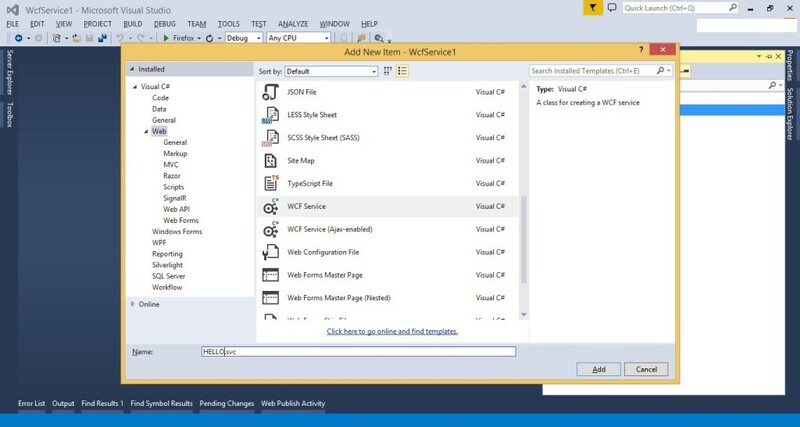 Create a new project and select WCF Service Application and give it the name WcfService1. Delete default created IService1.cs and Service1.svc file. From the Web tab choose WCF Service to add. Open IHELLO.cs and remove the “void DoWork()”. // NOTE: You can use the “Rename” command on the “Refactor” menu to change the interface name “IHELLO” in both code and config file together. To do this open the Web.config file. We are going to create one Endpoint with basicHttpBinding. We are adding a Endpoint also to configure the metadata of the service. Now we have created the Service and configured the Endpoint.To host it press F5 in Visual Studio. In the browser you will see the Service as in the following. To view the metadata of the Service click on the WSDL URL. In Windows / Web application we can consume this WCF service by using “Add Service Reference”->Add Service Address “http://localhost:57091/HELLO.svc” -> Click on Go. I had created console application and added service reference. Press F5 to run the Console Application and we got below output. I hope this will help you.Your valuable feedback and comments are important for me.